In this video, John Kosturos discusses an issue faced by most Marketo Admins; keeping the size of their database in compliance with the price that they’re paying. Every company obviously wants a big database filled with tons of customer information. But, if your database is large just because it is filled with duplicate records, than all you are doing is wasting money by keeping unusable data. John is going to show you how Marketo Champions at Altium, Aruba Networks, and other companies, have used RingLead to deduplicate their person records in Marketo, ultimately reducing the size of their database by 30% or more. When you log into DMS, you have a Bulk option under Cleanse that is a connection to Marketo directly. There is no dependency on other systems. From here, you can create what John calls “Deduplication Tasks”. You could have several deduplication tasks with different rules and different logics, but John created one in the video that gives him the ability to choose any Smart List out of Marketo. Your filtering is done in Marketo by choosing and creating Smart Lists. Then, you find those Smart Lists in DMS and set the matching criteria based on what you consider to be a duplicate. One of the very cool and very unique things about this tool, is that you can do complex algorithms. You don’t have to do rely solely on perfect email match, like Marketo’s Duplicate Prevention tool. John has built a rule that says, “the email match is an exact match.” He then creates a rule that says, “or the email match is a special type of match, which is email,” and you can strip brackets and things like that. Or, you can create a rule like, “last name strict”, “first name loose”, and “company name loose”. If the records in this Smart List match any of the criteria that I’ve given for matching, the system will group the records as duplicates. Once it groups the records as duplicates, the user can choose how the system is going to choose a master record when there are two or more records that need to be merged. In this scenario, John said, “the acquisition date is the oldest”, which means the oldest record is going to be the master rule. But, if they were created on the same date, then the last modified or viewed date is going to take over, and it’s going to say the newest viewed date would be the master. You can create, add, or subtract any rules that you want during the master selection so that you can paint the perfect picture of the merge. This is John’s favorite feature because if you have thousands or hundreds of thousands of duplicates and you’re trying to merge them, going through those records one at a time can be pretty painful. RingLead DMS Cleanse for Marketo gives the user the ability to set rules that will choose the winning field values for any field in your Marketo database. You can add or subtract rules, and the dropdowns have all the fields you could want. If it’s a text field, like Person Notes, we can concatenate the text together and create a single value. On the email address, John told the system to keep the newest value or the oldest value. You can basically build a rule on any field, and depending on what type of field, you’re going to get different operators for the rule. Once you’ve given the logic to the system for the master rules and the surviving field value rules, you can hop into the resolution screen where you can view anywhere up from one to 1,000 groups of duplicates on a page, and mass merge them. You can also merge whatever’s on the page all at one time. If you’re one of those Marketo admins that wants to reduce the size of your storage, the best way to do that is to us RingLead DMS Cleanse for Marketo. By running some quick de-duplication reports, and completing a merge, you can reduce the size of your storage substantially. 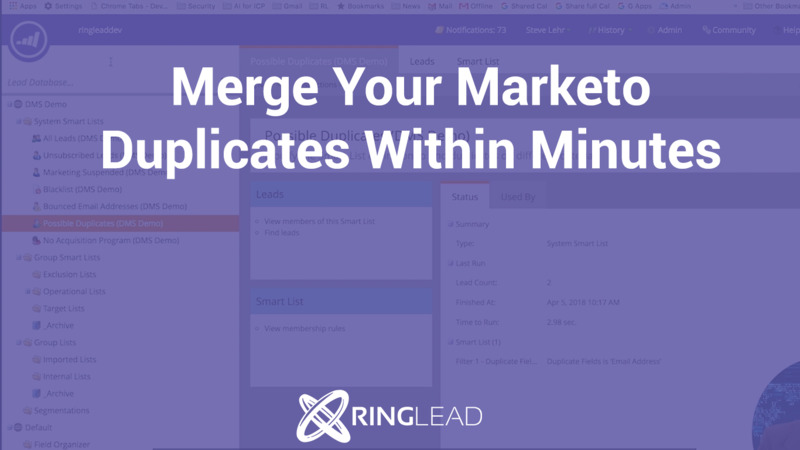 Best part is that it’s not going to take you a long time because RingLead makes it easy to find the duplicates and mass merge them. Want to learn more? Schedule a demo now by clicking the box below! PreviousPrevious post:5 Ws Of SalesNextNext post:Your Salesforce Integrations Are Up For Renewal; At Risk For GDPR?